Since 1979, we’ve existed to be devout followers of Christ and to live lives fully pleasing to Him. God has given us a special love for the people of Asia, and it is our desire to minister to them and help them through ministries like education, health and practical gifts, or through the spiritual transformation of peaceful hearts, restored relationships and mended lives. We do this all in community and in partnership with the global Body of Christ. More than 2 billion people haven’t had an opportunity to hear of the love Jesus has for them. There is only one missionary for every 78,000 people among those who are unaware of God’s love for them. More than 1 billion people worldwide don’t have access to a Bible in their language. More than 1,200 distinct cultures in the world are without an intentional gathering of believers among them. How can the people of Asia experience physical and spiritual transformation? What can we do to make a difference? God is ministering to people’s deepest needs in Asia through national missionaries. 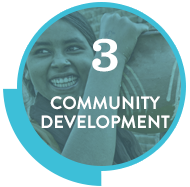 Built on the foundation of national missionaries, each part of our ministry works together to transform communities. National missionaries—simple, humble servants of God—minister daily to people’s deepest needs, both physically and spiritually, in communities throughout Asia. 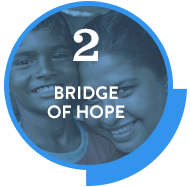 More than 70,000 children from impoverished families are being given hope and a bright future through Bridge of Hope. Clean water, income-producing farm animals, sewing machines and other simple gifts touch hearts and increase the health and livelihood of communities. 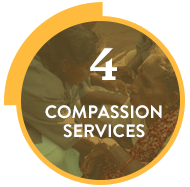 Leprosy patients, widows and victims of natural disasters find hope and help through GFA-supported Compassion Services. "I praise God for the great love and commitment of K.P. and Gisela Yohannan for the people of Asia. Millions have received the Word of God because of them and the ministry of Gospel for Asia." "It has been our privilege to work closely with the ministry of Gospel for Asia. The idea of training and supporting the local populace to do the mission work is certainly inspired by God. The success and growth of the work of Gospel for Asia is nothing short of a miracle. We can certainly endorse without reservation the effectiveness of this mission endeavor." "There are many who talk a good message but not too many who actually live it out. Gospel for Asia is serious about the challenge of reaching unreached people groups. The 10/40 Window is where the Gospel needs to go. And GFA is a major force standing in the gap today. They represent the primary unreached peoples on planet earth. GFA has what it takes to penetrate the 10/40 Window." "Gospel for Asia has become one of the more significant pioneer missionary agencies, with a good accountability structure....They are doing an excellent job." "God has raised up Gospel for Asia to build His Church in India. The spiritual formation of thousands of young lives...is meeting the urgent need of leadership at the grassroots level in rural, as well as urban, centers. 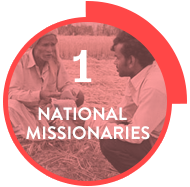 Their passion to share the Gospel of Jesus Christ and serve humanity is impacting India for Christ. The ministry of Gospel for Asia is blessed of the Lord and requires prayerful support by the people of God all over the world." "GFA is one of the largest missionary movements working across India...The impact of GFA's ministry in India is very significant."